The official NWN2 campaign and its add-on, "Mask of the Betrayer" (MotB), come with some very well coded crafting systems that expand on those that came with NWN1. Furthermore, they make use of essences in such a way that fits in well with the Althéa campaign mythos. In the world of NWN (Toril), some of the essences are referred to by their elemental name, which fits in well with the Althéa Colour scheme that also reflects the elemental equivalents: White = Air; Green = Earth; Blue = Water and Red = Fire. Furthermore, MotB also introduces the new Spirit Essence, which again complements the system to be used in the new era upon Althéa. After taking a closer look at the code behind crafting and the recipes involved, I can see that trying to alter the existing code may be more trouble than its worth. The reason being, whenever there are official updates and fixes, I would need to keep amending scripts I have also altered when making crafting changes. However, because the system is already quite extensive and stands on its own merit, I don't actually see the need to add to or alter this current system. Instead, I will create a system specific for my campaign over and above any official ones. Along with the official system, I hope to introduce a new bench that will allow for a new craft to be implemented that will involve the Life Essence. Basically, in much the same way there are already three different benches available to work with the current existing essences, I will introduce a new object at which the PC can work. It will most likely take the form of another workbench of some kind, but does not have to take this form exclusively. However, by doing this, I can add script to any existing items used in creation (e.g. the smith hammer) that will intercept the object being worked with and redirect the script to use my own craft creation code. Basically, in this example, the smith hammer would check the item upon which it was just used and if it detects new Life Essence apparatus, the code would then check my own item creation code instead of any normal code that would be run. This would be much easier to manage than trying to keep track of very large official crafting scripts and 2da files. 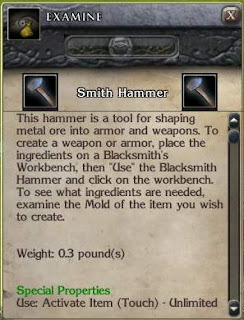 Just like the official campaign, the smith hammer will be required to craft certain items, especially weapons and armour. However, I will add extra code that will allow the smith hammer to work with other objects within the world of Althéa. 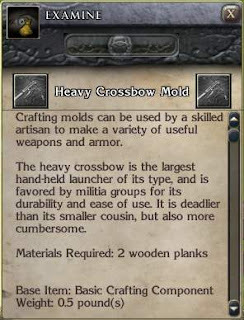 Here is an example of a heavy crossbow mold. Again, it will be the same as you would have expected from the official campaign, including information of what you would require to make the item. NB: In this example, the mold says 2 wooden planks. Note, however, that wooden planks can come in different forms and qualities. The weapon may have special abilities according to the quality of the wooden planks you use. The same theory exists if the mold may says metal ingots or some other object instead. 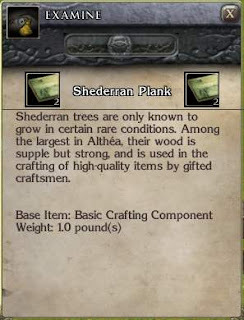 As an example of how I can alter existing items to help give the system a unique feel for the Althéa campaign, notice the wording in the following items for making a heavy crossbow from Shederran wood. NB: I have currently not changed the name of the specific wood, so as not to confuse players who may be used to the naming convention from the official campaign. However, if players would prefer to have the name changed to something unique to Althéa, then please leave comments with your suggestions. OFFICIAL CRAFTING INFO: For those players who would like to get a good background in the art of crafting as it currently stands, take a look at this website: Thieves Guild (Link now added to the Useful Links section to the left.). This site gives good recipe information for all known builds within the official crafting lists. However, if you would rather learn of all builds possible through playing, then do not refer to the lists given here. CRAFTING 2DA INFO: For builders who would like more information about the 2da's involved in altering the crafting system, check out this NWN2 Forum Link. Beware though, this thread goes into quite a bit of detail about the 2da's files involved and I did notice one or two minor errors that may confuse the issue. E.g. The author refers to line 5 instead of line 10 in one of the more informative posts. CRAFTING MOD: There is a mod that can be downloaded from the Vault, which was written by someone from Obsidian. It is called Crafting.mod. 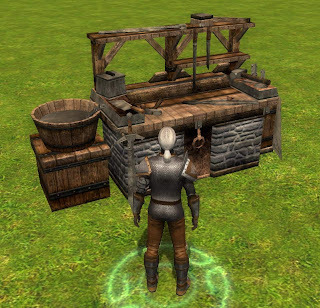 It is supposed to help create 2da lines that can be used to help write correct 2da structure for the crafting system. If you do want to try to add your own recipes within the current official crafting system, then I imagine this module would be an invaluable tool.